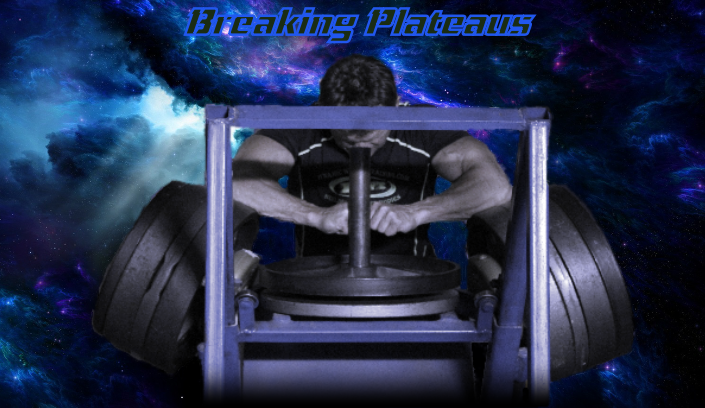 Welcome to breaking plateaus: if you have entered a training or dietary plateau, or have been in one for some time. This page hopefully will serve as a guide to help. Plateaus in training and in life are inevitable, but you shouldn’t dread them... lets find out Why. Whatever your achievement levels are doesn’t always mean this is going to coincide with the body’s nervous system of how it cycles its energy including it's sense of order and stability, in other words: the body regulates itself! It has its own agenda and runs on its own time. The bodies ability to cope, react and handle life’s everyday stresses and continually progress each and everyday, simply; is not realistic, everything has a limit! Let’s face it, if you could diet and lose a few pounds a week (assuming you weighed 200 pounds), by applying simple math you would find in less than two years you would diet yourself out of existence making this unrealistic. The same goes for the opposite: if everyone that trained with weights could expect to achieve a half inch of new muscle tissue on his or her arms each month continuously, within a few years-there wouldn't be a shirt that would fit you. Breaking plateaus and learning to train past them protects the body from injury and becoming to large for our present bone structure. So what does the body do? The body is a finely tuned organic computer it is so finely tuned; that your body’s central nervous system measures stresses that you’re putting it under, e.g. muscle tissue, bone, tendon and ligament strength, against overall rest/recovery and dietary nutrition it’s receiving. When the nervous system can no longer handle or cope with this. It will hit what is simply called: a training or restrictive plateau. Your body has only one agenda... to survive at all costs. These cycles of consistent-positive progress, such as: growth or strength increases etc., can last anywhere from a few weeks to little more than a month or so, where you can actually see and feel gains. This progress can vary for some: depending on age, gender, athletic and genetic ability may last 2 to 3 months. Generally speaking though; this progress will not last much longer before the body begins to come up against a new training plateau. Try to avoid frustration at a training plateau try to adopt the attitude of-everything cycles: with a start and a finish, maintain lots of small rewards on the road to your primary goal. If your a beginner, the first 6 - 8 months in your training or diet is the most productive. It's easy to see strength, muscle tone and density improve, because in the beginning; your strength curve has nowhere to go but up. If you start bench pressing with 50 pounds, it only stands to reason that in the next 4 to 6 months you will probably double this. But it might take you 1 - 2 years to be able to double the next lift, depending on your natural strength curve. The point being: you cannot see progress like this go on forever, the body plateau's to protect itself. Progress: is a funny word, its even funnier how it's measured, understood and viewed, it's usually in the eyes of the beholder. What one person thinks is beautiful, sometimes others do not. 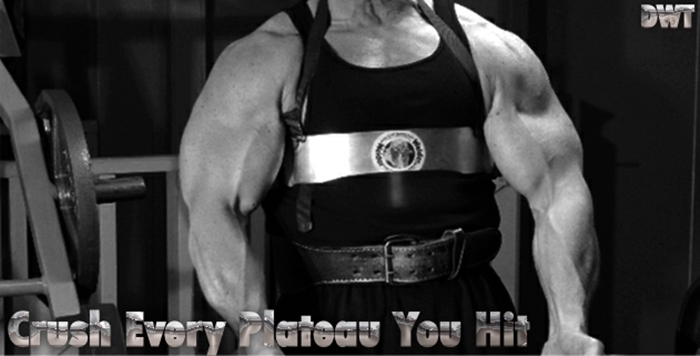 When it comes to breaking plateaus achieving and training past or beyond them is not easy, I'll admit. There are so many different ways to measure progress, this is why it is so important to keep a strong positive mental approach and outlook to all of your training and dietary efforts. If you only look at the weigh scale to monitor your weight or fat loss efforts, you're setting yourself up for a negative fall. When the days and weeks come that we don't see the scale move in our favour, we become frustrated. This is the body's way of telling you it's reached a new plateau, if you stay on track and don't give up; your body will continue to give you what you want, you just have to be patient with it. Breaking plateaus, and getting good feed back from a honest friend or using a mirror, or have a training partner take some photos, is a more accurate way to assess your physique or dietary progress. to take some time off, to do other things that you like and enjoy in life. The brain, body and central nervous system get tired from the constant push to new levels. New stimulation is always a sure way to new progress. Using the weigh-scale or a tape measure to measure your arms and progress, is not always accurate. Progress can also be seen in friends or families eyes of how they notice and comment on your physic changes. Or maybe you've recently seen yourself in a photo that a friend took that you look great in, or perhaps clothing is fitting differently and you're receiving complements on this more athletic look. I have 19 stairs to climb every day to get into my gym; each day of each week that I make those stairs is positive progress in my life, at my age. 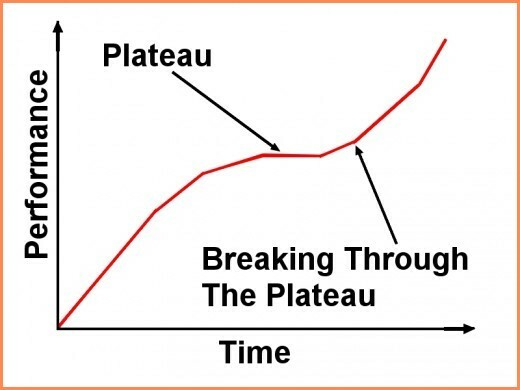 Have You Actually Achieved A Plateau? Sometimes a common mistake is thinking that we may have reached a dietary or weight training plateau, when in fact; you may not have? If you have only been dieting from 4 weeks - 2 months, and think you’ve hit a plateau. This may not be realistic, your body is only trying to customize and regulate itself with the new stresses you’re putting on it. If you think you’ve entered or have actually reached a training plateau, you may want to monitor what you’re doing; to what you’re trying to achieve. Taking a closer look at this can be done in different ways. Here might be some different questions you can ask yourself ? Have you been eating properly with enough calories from nutritious sources? Have you been getting enough sleep (seven to eight hours)? Are you staying hydrated and getting or receiving enough vitamins and minerals? 6 to 8 glasses a day and 10 to 12 if your physically active and live in a warm climate, this is essential for the brain and other basic functions. Are you staying focused on your training or dietary goal? (if not regroup, add some fun, change-up the exercises). Are you continuing to add variety in your training and meal planning? Are you still continuing with the reward system for small goals achieved as you continue towards your main goal? Breaking plateaus is difficult unless your consistent and its tough to be consistent if not adding variety and small rewards and some fun to your workouts and diet along the way. Know that-whenever you set your sights on a new goal, be it diet/weight loss, or entering any form of change that is associated to a more vigorous fitness lifestyle, takes some courage! When you’re first starting, its new and exciting you usually begin to see results quickly within a few weeks to a few months. After the first 6 to 8 weeks of any new weight training or weight loss program/routine, is where some begin to feel boredom creep in, often followed by feeling unsure at the direction of the goal. Self-doubt, lack-of-interest, anxiety can creep in if you let it, learning to mentally be strong enough to handle it when the scale or mirror is not moving or reflecting in your favor is where; breaking plateaus takes on a new dimension of determination. Keep your goal locked in your imagination, many fail to break through an old plateau because they don't visualize the goal of what they want to achieve strongly enough. Keeping it in the forefront of your mind and be determined to get there, is a great way to break the bark off of a tough to beat plateau! The power of your imagination and creativity that you express is your ultimate strength in this world... bar nothing! The people that go on and succeed at their hopes and dreams are no different than you or I. They simply make a decision and stick to it, meaning: they don’t stop and they don’t look back and they don’t back down when it comes to life's obstacles. In point: the body doesn't always necessarily want to follow you in your hopes and dreams. You often have to force it against its will, most of the time our bodies just want to watch TV, eat potato chips, drink soft drinks and have fun and be warm all of the time. The reality is: if your mentally strong enough to push your body and not let your body push you, your body in time will react much differently than you’re used to. its efficiency for burning calories, strengthening bone, muscle and connective tissue, increases self-esteem. This also builds a tremendous mental link that strengthens self-discipline helping us achieve any of life's challenges. Breaking plateaus takes a complete mental effort. 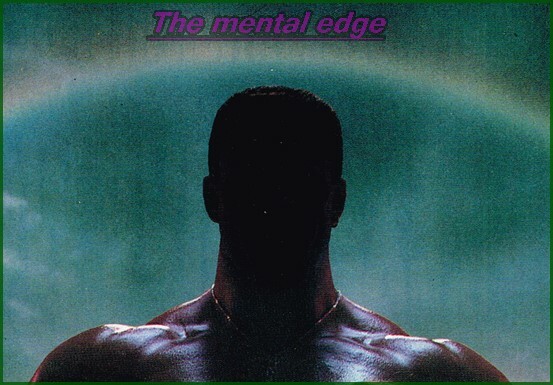 ‘Where the mind goes, so shall the body’. This is an old saying, but very accurate. If you’re not committed to what you’re doing, you’re going to really struggle to break through any plateau. At the end of the day, everywhere you go, no matter how many doors you open and close in life when it comes to breaking plateaus, most love to see progress. If they can't, they often quit! Breaking a plateau and moving through it to achieve a higher physical level, is a battle fought and won in your heart and mind and nowhere else! This is why it is so important to set a goal, plan for setbacks and obstacles that come up. Use your imagination everyday to visualize your goal, the closer you stay to what you desire, the better chance you have of achieving it! That’s if you let it, don’t quit on your goal, break every plateau that you hit and every time you do, both mental and physical strength will grow as a result. Each one after that; begins to get easier because you now know how. Nothing that’s worth having is ever easy, I encourage you-stay strong, push yourself to achieve each of them. Take the time to enjoy and appreciate the achievements you’ve made, as well as every plateau you've broken, and don't forget: always add variety and some fun.